Photo courtesy of the San Diego Sheriff’s Department. 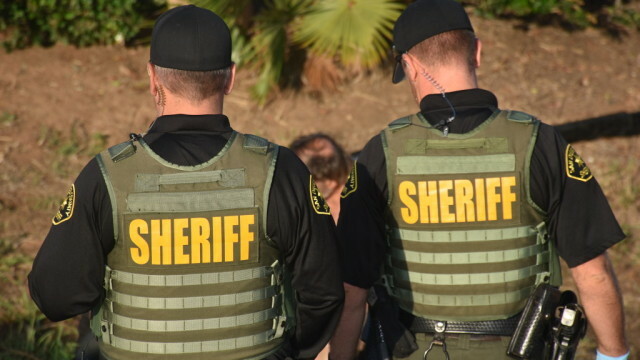 A knife-wielding man who had just stabbed a sheriff’s K-9 was shot by a deputy Saturday morning in Rancho Santa Fe, after taking a man hostage in his apartment, according to the San Diego County Sheriff’s department (SDSO). The incident began at about 5:30 a.m. when deputies were called to the 6000 block of Paseo Delicias for reports of a person yelling and breaking things, according to Sheriff’s Lt. Kenneth Nelson. Deputies were confronted by Edward Ray Nett, 50, who allegedly was brandishing a knife and threatening to stab them. Nett was on parole for violently resisting sheriff’s deputies in 2015. Deputies launched pepper balls at Nett and deployed Banjer the police dog in an attempt to take him into custody, Nelson said. Nett was not deterred by the pepper balls and allegedly stabbed Banjer under the left eye, broke into a nearby apartment and took the occupant hostage at knifepoint. The hostage broke free of Nett, ran into a bathroom and locked the door without injury. Nett yelled to the deputies outside of the apartment that he had just slit the hostage’s throat, then came out of the apartment and threatened to stab them, Nelson said. That’s when one of the deputies fired four shots at Nett, hitting him in the torso. Deputies took Nett into custody and gave him first aid until paramedics arrived. Then an ambulance took Nett to a nearby hospital. Nett’s condition was not released by the sheriff’s department but he was expected to recover from his injuries. Once Nett can be released from the hospital, he will be booked into jail on suspicion of several felony charges, Nelson said. Banjer was rushed to a veterinarian for treatment, underwent successful emergency surgery and was resting comfortably. He was expected to make a full recovery, Nelson said. The hostage and deputies were not injured.